Tobi's first day of school. Our little boy Tobi, 5 years old, just finished Prep last week. Many of you may remember when he was born and it really has gone very quickly. Thinking back to First Term (August last year) Dave and I wondered whether we’d made the right choice putting him in school as opposed to holding him back another year. Would he cope being the youngest? Would he adjust after so many changes? 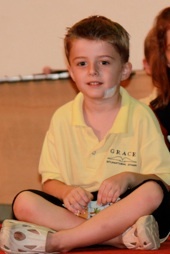 We had moved countries 7 months prior, visited Australia a few months earlier, moved him from a kindergarten that he loved and relocated ‘home’ again just the week before school commenced! There he was, the smallest fish in the deepest of oceans and for the most part of that term, I would imagine that he probably felt very much out of his depth. From the start, there was the issue of left-handedness and now that ‘formal’ handwriting had begun, this proved very challenging for him. There was also new teachers, new friends and a whole new way of life to cope with. You know, I think, deep-water experiences have the potential to either drown us or make us very strong swimmers! And, as a parent, you just do your best. You try to be supportive and understanding. And, like in swimming, there are times where, as the stronger swimmer, your job is solely to keep your child afloat. This week however, we watched as our little boy whose arms had been flapping and head had been bobbing just to stay afloat, finish his school year with strength, determination, strong strokes, a huge smile on his face and as someone who had conquered so many of his challenges and now has his eyes set on the next event… going in to Grade 1! 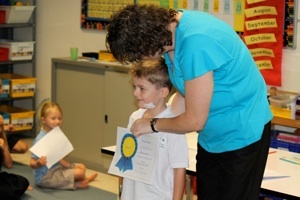 Last Monday I visited Tobi’s classroom to watch his class play and see the grade each receive an award from their teacher. There was the art award, acting award, show and tell award… you get the picture, well I was so shocked when Tobi got his award for penmanship and for having the neatest handwriting that I almost forgot to click the button on the camera poised in my hand. What a great lesson in never giving up! I remember Tobi commenting to me mid year that he preferred the week-long standardised test-taking as opposed to doing handwriting! But despite this, he would come home and color and draw and write and ask me to help him… and it finally paid off! I couldn’t have been more proud. Then on Wednesday, it was the elementary school concert. Well after arriving early and securing front row seats, we were once again blown away by our boy. He sung and danced his little heart out that morning and we sat there again just flawed! It’s moments like this that you say, “Thank you God. You brought him through. You care about this little one more than I ever humanly could but I thank you for placing him in our family and choosing us to be his parents. Please give us wisdom and strength as we raise all three of our precious children”. We are really looking forward to coming back to Australia in a little over three weeks time. We can’t wait to share with you some more of the stories that impact us here, that keep us on our knees in prayer and that increase our faith. I’ve attached a short movie of Tobi’s songs to finish… enjoy! From one very proud and very biased mother LOL! PS You may've noticed the patch on Tobi's face... he fell off our swing set the weekend before his last week of school... a trip to the hospital but thankfully no stitches required! PPS Just FYI, no, the uniform didn’t change mid- year, they have a mix and match uniform at Grace with a choice of navy or tan coloured shorts/ skirt as well as about 5 different coloured t-shirts.